COMMENTS:        This trigger occurred at longitude,latitude = 127.88,-13.09 [deg]. COMMENTS:        NOTE: This BAT event is temporally(26.0<100sec) coincident with the FERMI_GBM event (trignum=513110367). COMMENTS:        This trigger occurred at longitude,latitude = 144.95,21.92 [deg]. COMMENTS:       NOTE: This SPIACS event is temporally(20.0<100sec) coincident with the SWIFT_BAT event (trignum=745797). COMMENTS:        The XRT position is 1.01 arcmin from the BAT position. Dec(J2000) = -25d 14' 36"
with an uncertainty of 3 arcmin (radius, 90% containment, including systematic uncertainty). The BAT light curve shows multiple peaks with a duration of about 180 sec. The peak count rate was ~4500 counts/sec (15-350 keV), at ~4 sec after the trigger. Dec(J2000) = -25d 14' 37.7"
with an uncertainty of 4.7 arcseconds (radius, 90% containment). This location is 61 arcseconds from the BAT onboard position, within the BAT error circle. No event data are yet available to determine the column density using X-ray spectroscopy. with a 90%-confidence error radius of about 0.61 arc sec. This position is 3.7 arc sec. from the center of the XRT error circle. The estimated magnitude is 16.18 with a 1-sigma error of about 0.14. No correction has been made for the expected extinction corresponding to E(B-V) of 0.09. Dec (J2000): -25d 14' 37.3"
At 18:39:22.89 UT on 05 April 2017, the Fermi Gamma-Ray Burst Monitor triggered and located GRB 170405A (trigger 513110367/170405777), which was also detected by Swift (Troja et al. 2017, GCN 20984). The GBM on-ground location is consistent with the Swift position. The trigger resulted in an Autonomous Repoint Request (ARR) by the GBM Flight Software owing to the high peak flux of the GRB. This ARR was accepted and the spacecraft slewed to the GBM in-flight location. The initial angle from the Fermi LAT boresight is 52 degrees. The GBM light curve shows multiple peaks with a duration (T90) of about 78.6 s (50-300 keV). The time-averaged spectrum from T0+7.2 s to T0+86.0 s is adequately fit by a power law function with an exponential high-energy cutoff. The power law index is -1.01 +/- 0.01 and the cutoff energy, parameterized as Epeak, is 355.2 +/- 8.6 keV. The event fluence (10-1000 keV) in this time interval is (7.85 +/- 0.07)E-05 erg/cm^2. The 1s peak photon flux measured starting from T0+29.5 s in the 10-1000 keV band is 15.8 +/- 0.3 ph/s/cm^2. At 18:39:22.89 on April, 05, 2017 Fermi-LAT detected high-energy emission from GRB 170405A, which was also detected by Swift (Troja et al., GCN 20984) and Fermi/GBM (trigger 513110367/170405777). with an error radius of 0.51 deg (90 % containment, statistical error only). This was 53 deg from the LAT boresight at the time of the trigger and triggered an autonomous repoint of the spacecraft. This position is compatible with the XRT position reported by Evans et al. (GCN 20985). The data from the Fermi-LAT show a significant increase in the event rate that is spatially and temporally correlated with the trigger with high significance. More than 13 events have been observed above 100 MeV which are spatially and temporally correlated with the GRB. The highest-energy photon is a 900 MeV event which is observed 445 seconds after the GBM trigger. We note that roughly 5 ks of data are currently available. We will provide an update, if necessary, as more data become available. We observed the optical afterglow of GRB 170405A (Troja et al., GCN 20984; Hui & Meegan, GCN 20986; Vianello & Kocevski, GCN 20987) with the Nordic Optical Telescope (NOT) equipped with the ALFOSC imager. Observations were carried out in the SDSS griz filters, with a sub-optimal PSF (1.6-2.0"). We also note the presence of a nearby object approximately 2.3" W of the afterglow, also visible in the Pan-STARRS archival images (with a Pan-STARRS magnitude r = 21.82 +- 0.19 AB). 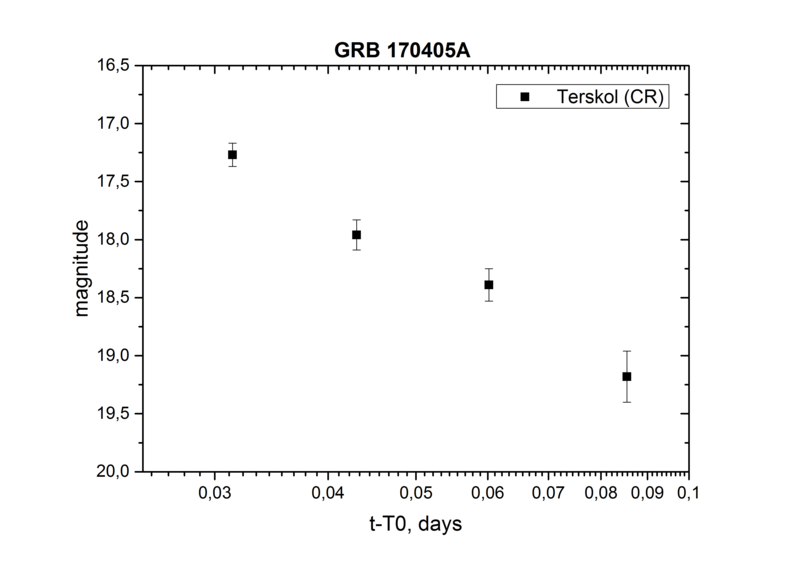 Its relation to the GRB is not clear, but its proximity may affect the afterglow photometry. We imaged the field of GRB 170405A detected by SWIFT (trigger 745797) with the TAROT robotic telescope (D=18cm) located at the Reunion observatory, France. We observed the field of GRB 170405A (Troja et al., GCN 20984; Hui & Meegan, GCN 20986; Vianello & Kocevski, GCN 20987) using OSIRIS on the 10.4m GTC at the Roque de los Muchachos observatory (La Palma, Spain). The observation consisted of 3x900s using the R1000B grism, covering the range between 3700 and 7800 =C5. The first spectrum started at 2:14 UT (7.57 hr after the burst). On a preliminary reduction based on archival calibrations we detect a spectral continuum with strong absorption features, which we identify as due to Ly-alpha, SiII, OI, CII, SiIV, CIV, FeII and AlII at a common redshift of z = 3.510, which we identify as the redshift of the GRB. We observed the field of GRB 170405A (Troja et al, GCN 20984; Hui & Meegan, GCN 20986; Vianello & Kocevski, GCN 20987) using the 40cm UCD Watcher telescope at Boyden Observatory in South Africa. Due to bad weather observations started at 19:31:13 UT, about 51.4 minutes after the burst trigger (T0=3D18:39:48 UT). A faint source consistent with the UVOT coordinates reported by Troja et al. is detected on our combined images taken with the SDSS r=E2=80=99 filter. At a mid-time of 20:00 UT, we derive a preliminary magnitude of r=E2=80=99=3D18.0 (AB system), confirming that the source has faded since the UVOT detection. Magnitudes were calibrated using several nearby APASS stars. No correction for Galactic extinction in the direction of the GRB has been applied. as calibrated against nearby Pan-STARRS objects. The nearby Pan-STARRS object mentioned by Malesani et al. is clearly visible in our stacked frames. The light curve shows a multi-peaked structure with a total duration of ~100 s and a hint of a subsequent weak/soft emission lasting until ~T0+200 s. The emission is seen up to ~10 MeV. As observed by Konus-Wind, the burst had a fluence of (1.05 =B1 0.12)x10^-4 erg/cm2 and a 64-ms peak energy flux, measured from T0+15.744, of (5.9 =B1 0.9)x10^-6 erg/cm2 (both in the 20 keV - 10 MeV energy range). The time-integrated spectrum (measured from T0 to T0+73.984 s) is best fit in the 20 keV - 15 MeV range by the GRB (Band) function with the following model parameters: the low-energy photon index alpha =3D -0.53 (-0.17,+0.19), the high energy photon index beta =3D -2.36 (-0.25,+0.15), the peak energy Ep =3D 244 (-27,+32) keV, chi2 =3D 98/96 dof. The spectrum near the peak count rate (measured from T0+8.448 s to T0+24.832 s) is best fit in the 20 keV - 15 MeV range by the GRB (Band) function with the following model parameters: the low-energy photon index alpha =3D -0.54 (-0.22,+0.24), the high energy photon index beta =3D -2.56 (-1.02,+0.27), the peak energy Ep =3D 265 (-36,+51) keV, chi2 =3D 71/96 dof. Assuming the redshift z=3D3.510 (de Ugarte Postigo et al., GCN 20104) and a standard cosmology model with H_0 =3D 70 km/s/Mpc, Omega_M =3D 0.3, and Omega_Lambda =3D 0.7, we estimate the following rest-frame parameters: the isotropic energy release E_iso is ~2.6x10^54 erg, the peak luminosity L_iso is ~6.6x10^53 erg/s, and the rest-frame peak energy of the time-integrated spectrum, Ep,i, is ~1100 keV. We observed the field of GRB 170405A (Troja, et al., GCN 20984) with the Reionization and Transients Infrared Camera (RATIR; www.ratir.org) on the 1.5m Harold Johnson Telescope at the Observatorio Astron=F3mico Nacional on Sierra San Pedro M=E1rtir from 2017/04 6.23 to 2017/04 6.48 UTC (10.93 to 16.85 hours after the BAT trigger), obtaining a total of 3.84 hours exposure in the r and i bands and 1.62 hours exposure in the Z, Y, J, and H bands. The nearby object noted by Malesani et al., (GCN 20988) is detected in all our images and might affect our photometric measurements. The reported values should be therefore considered as preliminary. We have analysed 6.5 ks of XRT data for GRB 170405A, from 111 s to 57.3 ks after the BAT trigger. The data comprise 489 s in Windowed Timing (WT) mode (the first 8 s were taken while Swift was slewing) with the remainder in Photon Counting (PC) mode. The late-time light curve (from T0+4.5 ks) can be modelled with a power-law decay with a decay index of alpha=1.66 (+0.14, -0.12). A spectrum formed from the WT mode data can be fitted with an absorbed power-law with a photon spectral index	of 1.592 (+0.027, -0.019). The best-fitting absorption column is consistent with the Galactic value of 8.7 x 10^20 cm^-2 (Willingale et al. 2013). The PC mode spectrum has a photon index of 1.84 (+0.09, -0.07) and a best-fitting absorption column consistent with the Galactic value. The counts to observed (unabsorbed) 0.3-10 keV flux conversion factor deduced from this spectrum is 3.6 x 10^-11 (4.2 x 10^-11) erg cm^-2 count^-1. If the light curve continues to decay with a power-law decay index of 1.66, the count rate at T+24 hours will be 5.5 x 10^-3 count s^-1, corresponding to an observed (unabsorbed) 0.3-10 keV flux of 2.0 x 10^-13 (2.3 x 10^-13) erg cm^-2 s^-1. The results of the XRT-team automatic analysis are available at http://www.swift.ac.uk/xrt_products/00745797. We observed the field of GRB 170405A (Troja et al, GCN 20984; Hui & Meegan, GCN 20986; Vianello & Kocevski, GCN 20987) with the 0.5m Virgin Island Robotic Telescope (VIRT) on February the 6th, starting at 6:15 UT (11.6 hours after the trigger). We performed a series of exposures in the clear filter. The weather conditions were good during the observations. We co-added the exposures taken between 6h15UT (t0+11.6h) and 7h29UT (t0+12.8h), for a total exposure of 3510s. At the position of the optical afterglow reported by Malesani et al. (GCN 20988), we do not detect any optical emission, with an upper limit of R = 21.3 (Johnson system) estimated from nearby NOMAD1 stars. Dec(J2000) =3D -25d 14' 09.7"
with an uncertainty of 1.3 arcmin, (radius, sys+stat, 90% containment). The partial coding was 6%. The burst was outside of the BAT calibrated field of view from T-134.3 s = to T+56.7 s. The mask-weighted light curve using the =E2=80=9Cdetection mask=E2=80=9D = (which covers a broader field of view, but is not well calibrated; see detail description in Mark= wardt et al. 2007) shows a multi-peaked structure that starts at ~T-30 s and ends at ~T+240 = s. The major peak occurs at ~T+5 s. T90 (15-350 keV) is 164.7 +- 35.4 sec (estim= ated error including systematics). The time-averaged spectrum from T+56.7 to T+242.5 sec (i.e., when the bur= st is in the BAT calibrated field of view) is best fit by a simple power-law model. T= he power law index of the time-averaged spectrum is 1.59 +- 0.12. The fluence in the = 15-150 keV band is 3.7 +- 0.3 x 10^-06 erg/cm2. All the quoted errors are at the 90%= confidence level. The upper limits in the UV bands are consistent with the reported redshift of z = 3.51 (de Ugarte-Postigo et al, GCN Circ. 20990). Using the ANDICAM instrument on the 1.3m telescope at CTIO, we obtained optical/IR imaging of the error region of GRB 170405A (GCN 20984, Troja et al.) at two epochs (with mid-exposure times of 2017-04-06 02:51 UT & 06:52 UT). For each epoch, several dithered images were obtained with total summed exposure times of 15 min in V and I and 12 min in J and K.
The fading afterglow of GRB 170405A (e.g. GCN 20984, Troja et al. ; GCN 20988, Malesani et al. ; GCN 20989, Klotz et al.) was detected with the preliminary magnitudes (or 3-sigma limits) listed below. Note that the optical photometry is calibrated against USNO-B1.0 stars in the field, so suffers from a large photometric calibration error of about +/-0.2 magnitudes, which has not been included in the errors quoted below. The IR photometry is calibrated against 2MASS stars. Additionally, the nearby source noted by Malesani et al. (GCN 20988) is seen and is likely affecting the afterglow photometry due to its proximity.